A full season past the demise of Carl Grimes, fans of The Walking Dead are still mourning the character's death. As difficult as it was for those watching, however, it stung the hardest for Chandler Riggs and his family. At the time, Chandler's father, William Riggs, had expressed his disappointment on social media with the creative decision to kill Carl. Riggs later deleted the comments, and in a new post on Facebook, he clarified his controversial comments and explained just how much of a gut punch it was for Riggs to be told that his popular character would be killed off in just a matter of episodes. "Just to clarify once and for all: Chandler Riggs didn't want to leave the show. He had been accepted at UGA, and would complete school while working (online when filming) as he had done high school for the last 8 years. Scott Gimple personally called him and said on a conference call in April that they needed him for 3 years. Chandler agreed to a 2 year contract, which was typical. 1 year guaranteed and the next one at their option, which was also typical. He signed the deal, graduated from high school and went back to work. He bought a house near the set and enrolled at UGA so that he could be close to work since we had been commuting nearly 2 hours each way all these years. It was the middle of June, his 18th birthday was coming up in a couple of weeks, 5 episodes were filmed, and they asked for my wife and I to both be at a meeting with Chandler- which was a little odd. It made me nervous but he and his manager assured me it was to plan for filming schedule, etc. Scott Gimple was the only one there and he told us that Carl would be gone in a few episodes. Chandler was absolutely devastated. I was disappointed Scott had been dishonest with a 17 year old making life decisions and waited to tell us. After it aired, I was asked to comment on how I felt. I did, maybe shouldn't have. 3 hours later AMC asked me to take the comment down- which I did- 6 hours later TMZ called and wanted me on and I declined. None of it has ever really been about me. Don't know why anyone would say anything about me- but that's ok- teaching Chandler to disregard negativity came with the deal so I can do it too lol. I never made it difficult for my son, our family had to work together to make it possible for him. Extremely grateful for the opportunity and 8 great years; as a parent I felt Chandler had earned better treatment, but that's the biz. Unkind timing." What's clear here is that Carl's death was completely out of the Riggs family's control. Chandler's education wouldn't have interrupted his shooting schedule any more than it did when he was in high school. 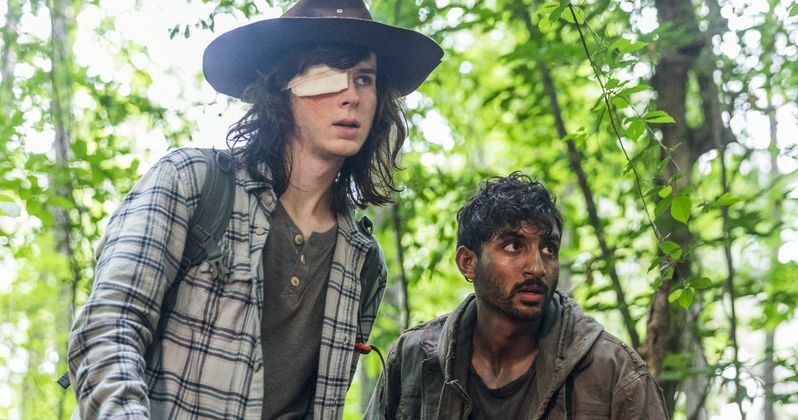 Given how Carl doesn't die in the books, the decision to kill him on the TV series was apparently just as shocking for Chandler as it was for every Walking Dead fan watching. Perhaps that element of shock was exactly what the producers were going for with Carl's death, but it may have had a negative impact on the show's viewership, with ratings continuing to decline in the episodes following the character's exit. Carl's father Rick Grimes has since exited the series as well, with Andrew Lincoln opting to leave the long-running show. However, unlike Carl, Rick was written out in a way which keeps his character alive. The current plan is for AMC to close out his storyline with a trilogy of TV movies focusing on Rick as the central character. Whether he appears in a future episode of The Walking Dead remains to be seen, but if he survives the upcoming movie trilogy, then it's always possible he could return. Losing the men of the Grimes family was a hard enough hit for the series cast, but it doesn't stop there. Lauren Cohan has departed The Walking Dead as well to star in a lead role on the ABC series Whiskey Cavalier. However, like Lincoln, Cohan left the show with her character alive, keeping the door open for Maggie to potentially return in an upcoming season or even her own spin-off series. We will see if Michonne will be written out of the series in the same way as Maggie, as it was recently confirmed that Danai Gurira is officially exiting the show as well. For what it's worth, we can expect Daryl Dixon to stick around for a while, as AMC is reportedly paying Norman Reedus an exorbitant amount of money to stay. The Walking Dead airs new episodes Sunday nights on AMC. Despite the gradually dwindling viewership numbers, the series remains one of the most popular shows on television. Already renewed for season 10, we can expect the series to continue at least into 2020, even with all of these major losses to the cast. You can see the original post from William Riggs over on Facebook.